Stephen Rex BrownEarlier shoot at Cafe Orlin. From Bettie Page to Marilyn Monroe. “Smash” is in the neighborhood yet again. The NBC drama about the production of a Marilyn musical will be filming on St. Marks Place, between First and Second Avenue, tomorrow. Cars must be moved by 10 p.m. tonight. 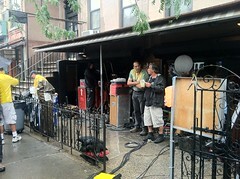 Scenes will be filmed outside, but St. Marks will remain open to traffic, a locations spokesperson said. Passersby who haven’t yet tired of seeing the show filmed around the area should be able to watch from a distance.